Memorial Day weekend is just around the corner and (unofficially) marks the start of the summer traveling season! Do you and your family have any big summer plans this year? Prep your carry-on. Let’s be honest – no one’s mouth feels particularly fresh after a long flight. Fight airplane breath by planning ahead; pack travel-sized toothpaste and mouthwash, a travel toothbrush, floss, gum, and mints. Remember to drink plenty of water throughout the flight. Trust us, the person sitting next to you will thank you. Pack healthy snacks. Bring along portable, easy-packing healthy snacks, such as sliced apples, baby carrots, string cheese, and bottled water. Take brushing breaks. Whether you’re camping, sight-seeing, or road-tripping, take a moment to brush your teeth when you stop for bathroom breaks. Avoid a dental emergency. Accidents happen – but take simple, common-sense precautions while traveling to prevent disaster! Avoid chewing ice or hard candy. Don’t rip tape or open packages with your teeth. End each day with a thorough cleaning. If you’re unable to keep up with your normal healthy habits while traveling, be sure to make your evening brushing and flossing really count! Schedule a cleaning and checkup before your trip. The best way to start out your travels is with a clean, healthy mouth! Call us at (425)774-5596 to book your appointment right away. 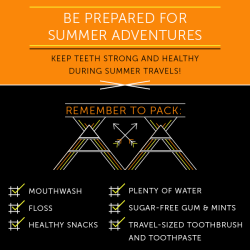 With a little advance planning, you can easily maintain healthy, strong teeth during your summer adventures. Dr. Nichole Martin and the entire team here at Heavenly Smiles look forward to hearing all about your travels during your next appointment!